Here is our Halloween mantel for this year . I have changed it 4 times :) and I think its finally where it will stay ! I used a leaf garland, berry garland, purple and black tulle , and black and white check burlap ribbon for the garlands. 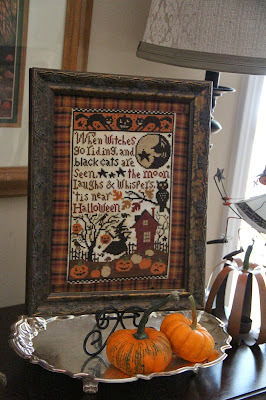 I made this spooky banner out of wood pieces and ribbon I got at Joann Fabrics .. 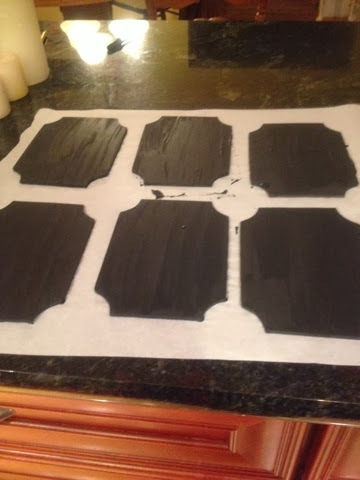 Painted them with chalkboard paint and used chalk to make a #spookyspaces banner ! I glued ribbon to the top of each board , then used a branch from the yard and glued the ribbons to it. 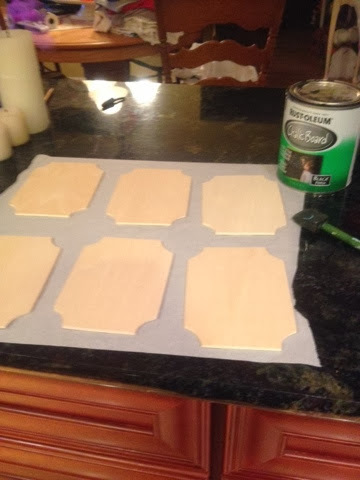 This was a really inexpensive project , the little wood pieces are only 79 cents each ! The pumpkins are real , I needed a couple pumpkins for the mantel and why go buy fake ones when you have 95 of them in your yard ? I painted the stripes with chalk paint and added crystal glitter .. The Boo pumpkin is white and I used chalkboard paint and glitter. 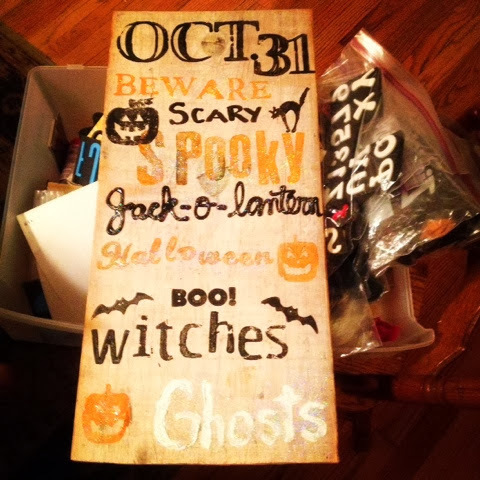 The little Boo sign is another wood piece I painted with chalkboard paint. The candlesticks that the pumpkins sit on were orange and black with a Halloween pirate theme , so I painted them with chalk paint .. I made the subway art with foam stamps, acrylic paint and puffy paint on an old board. On the fireplace hearth I have this galvanized faux olive bucket , filled with branches. A thrifted silver tray , glued to a stick, was chalkboard painted in the center. I am so loving the whole chalkboard craze ! On the sofa table I have a couple candlesticks topped with a velvet pumpkin , and a couple Halloween characters.. A little blue wooden box holds a book page pumpkin and some gourds . 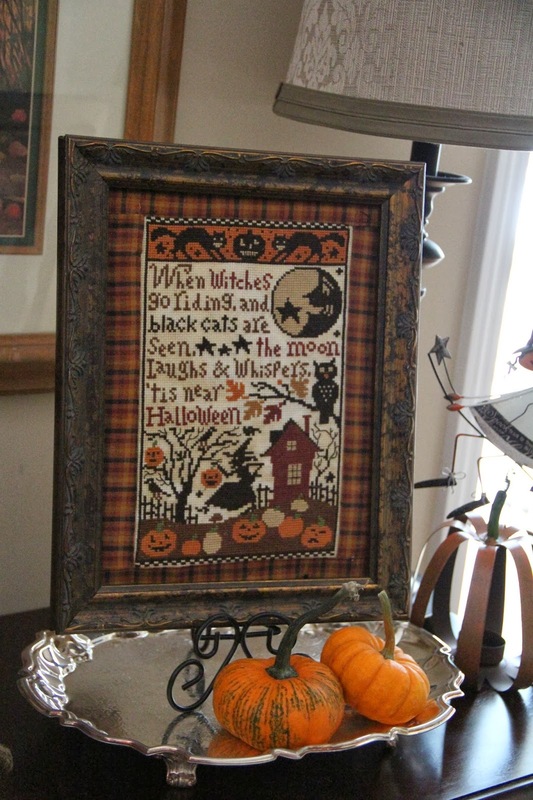 My favorite cross stitch is out for the season on a silver tray with a couple little pumpkin gourds.. I hung the spooky banner I made a couple years ago on my chalk painted buffet.. I used my cricut to make this banner. I made this ghost doll , folded her legs up and placed her on this ceramic cake stand. 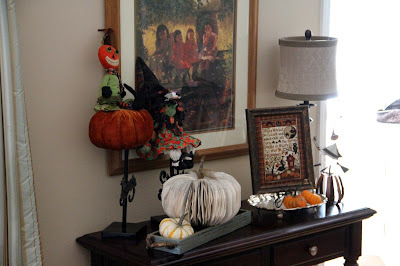 Added a couple glitter pumpkins and a couple real pumpkin gourds ..on a silver tray. 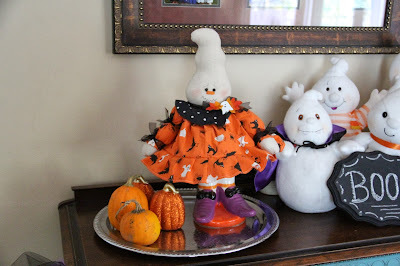 My Hallmark ghosts came out again ..5 of them for my 5 kids.. I added a chalkboard painted sign .. Thanks so much for stopping by ! I appreciate all of your visits and comments ! There is still time to use your Joann Fabrics coupon ! I love it. I'm so glad I found your blog a week ago. So can't believe I've missed out on it this long. You really have a hand to make it beautiful. I love to visit your blog! Wow you are so creative and crafty! 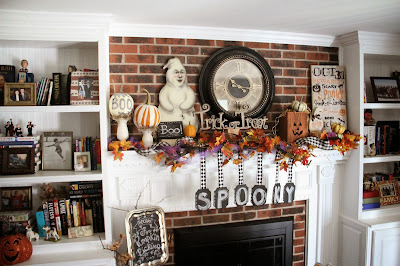 Love the mantel- the banner you made is excellent! All of your chalkboard creations are great-and the subway art is my favorite! You have a great collection of hand made items. 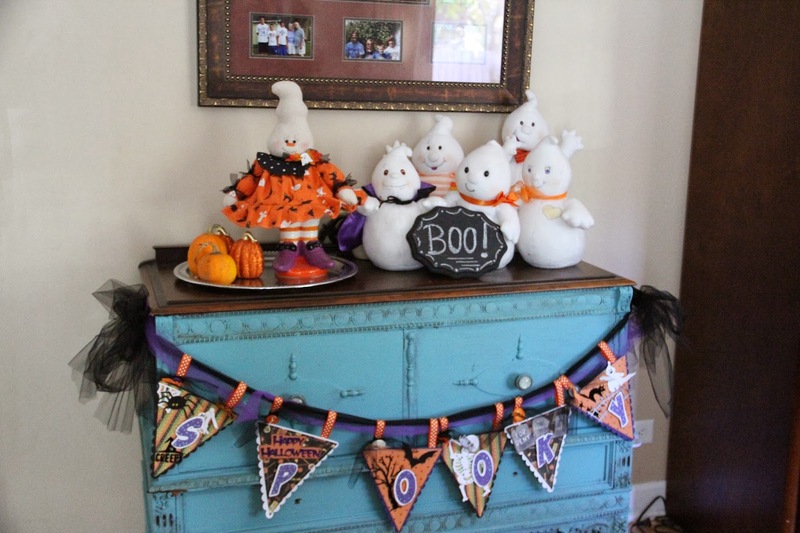 Love the Hallmark ghost display and the cute gourds on the silver tray- the banner plays off nicely on the turquoise chest! Good morning Priscilla. 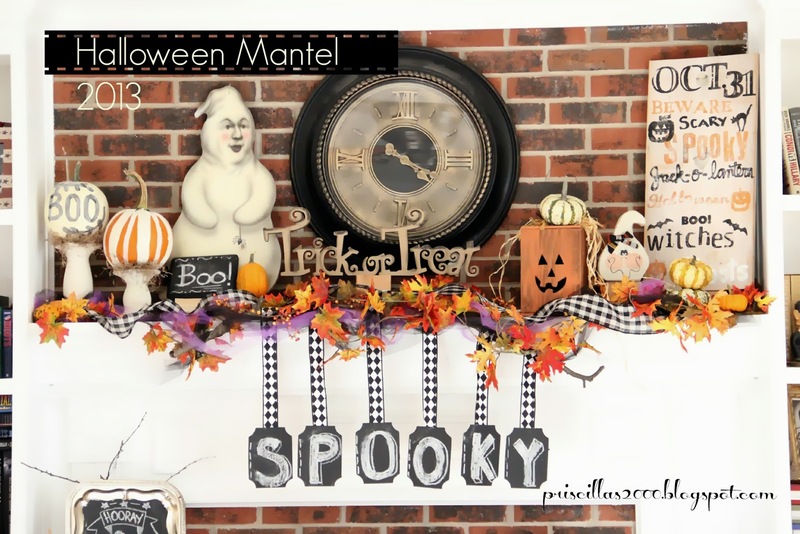 I love your Halloween mantel! My favorites are the Halloween stitchery, and the cute ghosts!!!! Love it all though!! So fun!! Everything is wonderful! 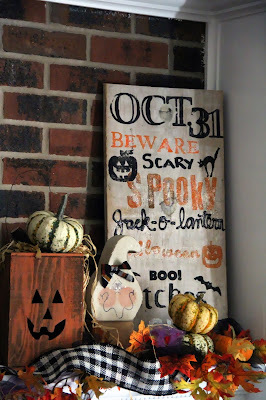 I love all the creative decorative touches!! Ah--there's my favorite PS finish of yours, Priscilla!! Why haven't I stitched that one myself yet? It is just adorable--love the plaid border you used, too. Your little bunch of ghosts are the sweetest! And I love your cross stitch. I know I need to make a banner, too...you've inspired me! Have fun! Wow! So many great ideas!!! I host a weekly link party called Seasonal Sundays and would love to have you link your post. The link goes up on Saturdays at 7pm EST. Your home is just beautiful and so ready for Halloween! So fun Priscilla. I like the spooky banner hanging down for a change. I love that cross stitch! Your entire home looks so festive. 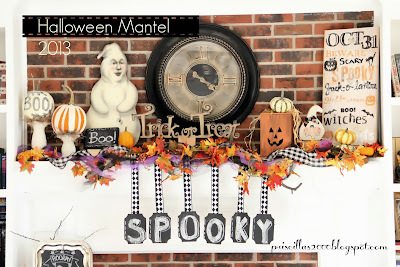 I love this mantel and I featured your mantel on a Halloween Mantel round up on my blog! You did a fabulous job and I wanted to share it with my readers! So cute! The subway art turned out great! And, that ghost on your mantle is awesome!